When you invest in vacation property, you’re looking for that lifestyle purchase to make family memories for years – or generations – to come. But you’re also looking for a good return on your investment, right? Canadians who understand that “value” pertains to more than just money explains why so many of them are crossing the border to purchase chalets at Lofty Mountain Grandeur. See what some of our Canadian buyers have to say about their purchase. In fact, nine of the 12 properties in Bailey Hills – Lofty Mountain’s SOLD OUT Phase I project – have been purchased by Canadians, with many more expressing interest in our newly available Phase II lots in Rainbow Ridge. We are offering a special exchange rate discount for potential Canadian buyers on Lot 15. Contact us for more information. Defining value in so many ways. When you compare Lofty Mountain with Canadian resorts such as Blue Mountain and Collingwood, you’ll clearly see why Lofty Mountain offers true financial value – and so much more. But let’s look first at the financial value of purchasing a Lofty Mountain Grandeur chalet. Even with the volatility of the Canadian dollar, real estate remains a very good investment, particularly when you are looking for a four-season lifestyle your family can enjoy for generations. Cross the border…and you’re in paradise! Conveniently located just across the border, Lofty Mountain is just minutes from Allegany State Park and Ellicottville, NY, a quaint town known as the “Aspen of the East” because of its excellent skiing facilities, such as Holiday Valley and Holimont. An easy drive from Toronto, Lofty Mountain is less than an hour from Buffalo, NY. You’ll forget all the tensions of city living once you’re nestled in your cozy chalet, surrounded by miles of trails, ponds and streams for hiking, biking and snowshoeing. Love to golf? Enjoy kayaking? Both are just down the road! And you’ll never grow tired of the breathtaking vistas and stunning year-round views Lofty Mountain (and Mother Nature!) provide. Our custom award-winning timber frame chalets bring the outdoors inside, from the 100-year-old barn wood to other unique touches by talented builder Dana John, such as the handmade jack fence and stone signage. An all-new, fully completed infrastructure includes roads, underground electric and more, making Lofty Mountain rustic and charming, as well as efficient and accessible. Choose the design that best meets your family’s needs. You can choose from two designs – 3,000 square feet or 2,300 square feet – both three-level maintenance-free chalets with all the amenities – just waiting for you to move in. 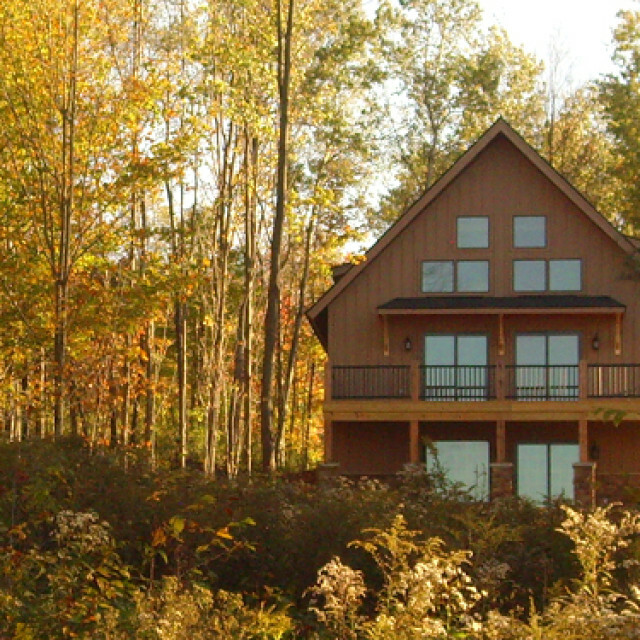 Each chalet sits on five acres of land, strategically placed to take advantage of the view while providing privacy. Our community association takes care of all outdoor maintenance so you are free to kick back, relax and enjoy your family and friends! Come visit Lofty Mountain. Step inside one of our gorgeous chalets, walk the trails, listen to the birds, take in the view. Then tour other properties. We’re confident you’ll feel exactly as we do that Lofty Mountain Grandeur is where you’ll want to create your legacy.